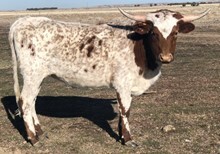 Purchased from the outstanding herd of Stockton-Burton at the Marquess Arrow Ranch production sale. She has huge horn base that are really heading backwards. We are excited to cross her genetics into our herd. Heifer calf by PCC Front Runner.